Operation Dragoon was part two of Ike’s one-two punch against the Germans in France. The country’s sunny southern coast was the target. After agreeing to the operation the previous fall, Churchill had been arguing against it ever since. Originally called Operation Anvil and scheduled to coincide with Operation Overlord—the Normandy Invasion of June 6, 1944—Operation Dragoon had been postponed due to the slow progress of the Allied advance in Italy and the resulting shortage of troops and troop-carrying LSTs (Landing Ships, Tank). The delay gave Churchill another two months to try to persuade Eisenhower to replace the French Riviera landing plan with one for an assault launched from recaptured Italian turf. British strategists were not alone in opposing Dragoon: Lieutenant General Mark Clark, whose US Fifth Army had finally captured Rome in June after months of struggle to make it halfway up the Italian boot, also believed an assault across the Adriatic Sea from Italy onto the Balkan Peninsula and north into Germany made more sense. But Ike stood firm. A successful invasion along the sun-drenched Riviera, he argued, would draw German attention away from Allied advances in the north and provide the Allies with two excellent ports, Marseilles and Toulon. The limitations of France’s smaller northern ports were already holding up the delivery of American equipment and troops; faster delivery of men and materiel, including French soldiers eager to liberate their country, would hasten a German withdrawal from France. President Franklin D. Roosevelt, meanwhile, was determined to make another move into France to placate Soviet Premier Josef Stalin and to satisfy the nagging demands of General Charles De Gaulle, who was eager to get French troops back on their home turf and buttress his claim to leadership of the government. Roosevelt also feared along with Eisenhower that rough terrain in the Balkan region would slow any advance there to a crawl. “For purely political considerations over here,” he told Churchill, “I would never survive even a slight setback in ‘Overlord’ if it were known that fairly large forces had been diverted to the Balkans.” Operation Dragoon would go forward, named by Churchill who felt “dragooned” into accepting it. An assault plan for Dragoon drafted by the Seventh Army had been ready for months, but the on-again, off-again status of the operation made advance training for it difficult. This was especially true for the 10,000-man 1st Airborne Task Force, a collection of American and British paratroop and glider infantry units patched together just a few weeks before the operation’s launch. Another provisional unit, the Troop Carrier Air Division, was assembled to deliver the paratroopers and lug the powerless and ungainly gliders, which resembled giant grasshoppers and were about as maneuverable. The 1st Airborne Task Force at least had the advantage of proven leadership in the person of 37-year-old Major General Robert Frederick. Dubbed “the greatest fighting general of all time” by Churchill, the dapper Frederick was already legendary for developing the elite American-Canadian 1st Special Service Force—the famed “Devil’s Brigade”—and for having been wounded at least eight times. Dragoon’s top brass—Major General Alexander Patch, Vice Admiral H. Kent Hewitt, and Major General Lucian Truscott—was equally capable. The hard-driving, 49-year-old Truscott had personally led the 3rd Division in Tunisia, Sicily, and Italy and was an expert in amphibious warfare. Now he commanded Patch’s VI Corps. The units picked to lead the invasion were proven, too. Truscott’s VI Corps, which included the 3rd, 36th, and 45th divisions—all of which had bloodied Germans in Italy—was the vanguard of the Seventh Army. After the fall of Rome on June 4, these units had been pulled out of line, rested, and given refresher exercises in amphibious landings. They would go ashore first. Scheduled to land behind them were the four divisions of General Jean de Lattre de Tassigny’s French Army II Corps, and Patch’s Seventh Army. The Dragoon plan called for early morning raids on each of the German flanks, followed by paratroop drops and glider landings around Le Muy, a transportation hub a dozen miles from the coast. 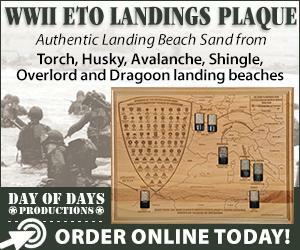 Once organized on the ground, the 1st Airborne Task Force would go after Le Muy and keep German reinforcements from reaching the beachheads—blocking roads, laying ambushes, and killing any unfortunate Germans they stumbled across. Supported by the usual massive air and naval bombardment, the roughly 151,000 men of the Seventh Army—led by the three chosen VI Corps divisions—would then hit the beaches wave by wave in landing craft brought in by Admiral Hewitt’s Western Task Force, an armada of some 900 vessels that included nine aircraft carriers, five battleships, and scores of destroyers and cruisers. Patch’s army would storm ashore along 45 miles of France’s southeastern coast between Cavalaire and St. Raphael-Agay, east of Toulon and west of Nice. On the left, Attack Force Alpha—featuring the 3rd Division, the famed “Rock of the Marne”—would hit the beaches southwest of St. Tropez, clear the small peninsula there, and move inland. Attack Force Delta would strike in the center, just north of St. Tropez, with the 45th Division “Thunderbirds” taking the coastal town of St. Maxime and linking up with the 3rd in a movement northwest. On ground stretching from Delta’s right flank to the northeast of Antibes, Attack Force Camel would deposit the 36th Division “Texas Army,” whose men were to take St. Raphael and Fréjus and secure the right flank. With beachheads established, DeLattre would lead his French troops through the VI Corps’ secure left flank westward to capture Toulon and Marseilles. The Allies’ intention to follow up on Operation Overlord was common knowledge, even to the average person on the street. With Adolf Hitler’s legions reeling from the Allies’ blows to their head at Normandy, German officers responsible for defending southern France expected a heavy body blow somewhere in the Mediterranean. But where and when it would come remained a mystery. Furthermore, German forces, which already had their hands full coping with the bedeviling guerillas of the French Forces of the Interior (FFI), were in disarray and vulnerable to surprise. Hitler had left Army Group G’s commander, General Johannes Blaskowitz, dangling in the wind, with no hope of reinforcement, to repel what would surely be a huge invasion force. The recent transfer north of most of Blaskowitz’s First Army left the Mediterranean coast in the hands of his Nineteenth Army, under Lieutenant General Friedrich Weise. German forces in southern France totaled about 230,000 men, but they were spread from the Spanish to the Italian border. With the powerful 11th Panzer Division several days from the coast, and two to four divisions divided between Marseilles and Toulon (which Hitler insisted on defending to the end), perhaps 75,000 German soldiers were left in a thin line along the immediate assault area. The beauty of the situation, from the Allied perspective, was that the Germans guarding the landing zone were completely unaware the invasion was coming to their sector. Softening up the coast in the days and weeks before the invasion, bomber pilots of the Mediterranean Allied Air Forces did their best to disguise their real targets by pounding sites from Genoa, Italy, to well past Marseilles. Efforts to confuse the Germans continued even into the morning of the attack, when one squadron of planes dropped radar-clogging aluminum strips over the Marseilles-Toulon area, followed by hundreds of booby-trapped, parachute-borne dummies north of the cities. While German infantry raced to address this supposed threat, American PT (Patrol Torpedo) boats caused German radar operators further grief by dashing in and out of harbors. Dawn of August 15 was a good five hours away when Attack Force Sitka—2,000 black-faced members of Frederick’s beloved 1st Special Service Force, now led by Colonel Edwin A. Walker—hopped from rubber boats onto the potentially troublesome islands of Levant and Port Cros off the left Alpha flank. These self-described “fighting screwballs” quickly secured Levant, defended by perhaps 150 men with little more than “Quaker guns”—fake artillery made to give the impression of formidable defenses. German defenders in a monstrous old fort on Port Cros would hold out for two days, but the Alpha flank was secure. Meanwhile, 1,000 French commandos—Attack Force Romeo—snuck ashore at Cape Negre, scaled the cliffs there, and crept inland to block the vital coastal road, which ran east to west along the entire landing zone. French infiltrators of Attack Force Rosie, charged with the same task on Camel’s far right flank, stumbled into a darkened mine field and lost 10 men to German machine-gunners. Despite all this activity, the Germans remained unaware of the assault about to hit the coast. French survivors of the ill-fated Rosie Force were still trapped in the minefield when Yanks and Brits began parachuting from some 400 troop carriers buzzing over the darkened French countryside. Thick fog and off-target drops forced large groups of parachutists to fight their way back to rendezvous sites from as far as 20 miles from Le Muy. One chalk of paratroopers mistakenly jumped to their deaths over the Mediterranean Sea. But the bulk of the airborne fighters landed within trotting range of their scheduled drop sites and got to work wreaking havoc. Two companies of the 509th Parachute Infantry Battalion that mistakenly landed outside St. Tropez made the most of their misfortune, joining with French resistance fighters to storm the town. The early-morning glider landings were predictably harrowing. Released from their tow planes, the gliders soared over strange fields, many studded with mined anti-glider poles known as “Rommel’s Asparagus” for German Field Marshal Erwin Rommel, who had come up with the idea for them. The glider pilots found places to land, then coasted, bumped, and smashed their way to a stop on French soil. Few of the aircraft remained in one piece, and scores of pilots and passengers were seriously injured. At least one general was dead. But the airdrops delivered tons of ammunition, antitank guns, and vehicles to grateful paratroopers. A second wave of landings made in the afternoon would prove costlier. 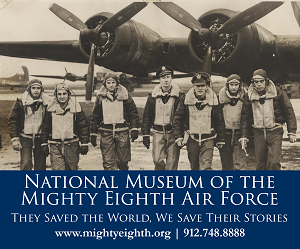 One pilot later described the scene in the air as “like Piccadilly Circus at high noon with the traffic being directed by an insane policeman.” Forced out of formation as they ducked in and out of fog and cloud banks, C-47 pilots towing the gliders cut air speed, dipped wings, or released their cargoes early to avoid collisions. At least one glider came apart and dumped its occupants—all without parachutes—to their deaths. Several others collided in midair. From their perch aboard the flagship Catoctin (a fantastic new communications vessel stuffed with state-of-the-art communications equipment), the American brain trust watched the French coast with trepidation. They had all seen aerial photographs of fortified German gun installations above the beaches and rows of barbed wire below, and they presumed the water was mined. Allied bombs had taken out many of the larger German outposts, but there was no way to be sure how many infantrymen were stashed inside the hardened pillboxes that remained, or how fast reinforcements would arrive once word of the attack spread. Nightmarish visions of the bloody Anzio and Salerno landings in Italy in the past year filled their heads. In reality, however, Patch had every advantage, including surprise. Some German officers had been told the Allied assault would land at Genoa, Italy, 100 miles to the east. A few of the scattered Luftwaffe planes in the area had spotted the conspicuous invasion fleet as it steamed up the Italian coast, but they had missed Hewitt’s skillful pivot to the west in the nighttime fog of August 14. The hideous scenes that had darkened the Italian beaches and the sands of Normandy did not play out on the Riviera. With the aid of new radio-controlled Apex drones (basically, landing craft filled with explosives), Allied minesweepers and frogmen did their best to clear the beach approaches of deadly concrete barriers planted beneath the waves. Then, at 6 a.m., two hours before H-hour (the assault’s start time), bombers of the Twelfth Tactical Air Force began riddling the coast with exploding steel. The Riviera was still rumbling and smoking when Hewitt’s battleships, cruisers, and destroyers opened fire. With naval shells screaming overhead on the way to shore targets, and the few remaining German coastal guns (hidden inside beach huts or camouflaged with paint) spewing shells at them, rectangular LCVPs (Landing Craft, Vehicle and Personnel) stuffed with anxious infantrymen headed for land. German 88mm guns and mines blasted a few of them, but most beached right on time, and a dozen American battalions scrambled ashore against light opposition. In Alpha sector, Major General J.W. O’Daniel’s 3rd Division quickly picked its way inland and struck out in three directions. Leading a body of 7th Infantry troops west, Staff Sergeant James P. Connor fell bleeding from three wounds, but urged his men forward: “If you have to dig the bastards out with your bare hands, then go ahead and dig them out!” Reinforced by other patrols, the gung-ho group swept on to capture Cavalaire. To the north, troops of the 15th Infantry fought their way past minefields and machine gun nests on their way into St. Tropez. They reached the town in mid-afternoon, greeted by jubilant FFI fighters and sweaty American paratroopers, who had been fighting on and off for hours. By nightfall, St. Tropez and its vicinity were free of enemy opposition. A similar scenario unfolded in the center, where the Thunderbirds expected to find hell on earth but instead dashed ashore under relatively pleasant conditions. Only the unluckiest took hits there; Sergeant Vere “Tarzan” Williams was one of them. A German mortar round exploded a few feet from him, and shrapnel knifed into his leg and the flesh of men lying near him. “One had his face bleeding and the other had his hand hit,” he later recalled. “I looked at my leg again and seen a hole in the pants leg.” He led a quick dash for the cover of a nearby boulder, seconds before a German shell smashed into ground behind them. Williams and the men around him were among just a handful of Thunderbird casualties, and St. Maxime fell after some tough fighting late that afternoon. The story was different on the far right. There, the 36th Division ran into trouble. 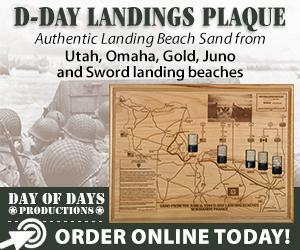 Landings went smoothly at the beaches codenamed Green and Blue, but Beach Red, where the 142nd Infantry Regiment was due to go ashore, proved unreachable. Energetic German engineers had gone all out, building a massive antitank wall fronted by a 12-foot-deep moat and planting a frightening network of mined concrete blocks, double rows of barbed wire, and yet more mines on the beach. German machine gun crews squatted in wait along the wall, while 75mm, 88mm, 100mm, and 105mm guns blasted away from several directions at lumbering American minesweepers. Follow-up bombardments from destroyers, cruisers, battleships, and even a flight of B-24 Liberators failed to silence the Germans’ big guns. Finally, after heavy shore fire dashed one landing attempt, Rear Admiral Spencer S. Lewis ordered the 142nd east to Green Beach, where there were no Germans. The following morning, the infantrymen swept west to take Frejus from the rear, while the 143rd Infantry claimed St. Raphael. Meanwhile, Frederick’s 1st Airborne Task Force pushed south and west, gobbling up small towns, making contact with the FFI and Truscott’s advance forces, and sealing off the coast to the Germans. On August 16, elements of the 509th Parachute Infan-try and 550th Glider Infantry Battalion, with help from 45th Division tanks, drove off Le Muy’s German defenders. Other paratroopers captured Draguignan, along with a German general and a corps headquarters. With all communications cut by Allied bombs, French guerillas, or the fast-spreading paratroopers, German officers trying to rally a defense were reduced to dispatching motorcycle couriers, most of whom were caught or shot down. Shell-shocked German regulars and relieved conscripts poured out of battered bomb-proofs to surrender as German Nineteenth Army units across the south of France withdrew hastily towards the Rhone River Valley, hoping to outrun pursuit northeast and back into Germany. After two days on French soil, the VI Corps had secured a perimeter that extended some 20 miles inland. Eager troops of De Lattre’s II Corps spilled onto their home soil and filled the coastal roads heading west. Thousands of Free French, whose knowledge of the terrain and German positions was finally bearing fruit, rushed to the sides of their returned countrymen. Four days of skirmishing had French units knocking on the doors of Toulon. Armored units rolled on to Marseilles. Tough street-fighting and thousands of tons of naval shells and air force bombs forced the capitulation of both cities on August 28. Reinforced by his old friends, the 1st Special Service Force, Frederick shifted his airborne task force east to block German infiltration from northern Italy. Meanwhile, elements of the US 3rd and 45th divisions cleared out the balance of southeastern France, while Truscott’s deputy, Brigadier General Frederick B. Butler, raced north to outflank the Germans with a hard-hitting force of tanks and tank destroyers, artillery, and motorized infantry. Previously an outfit that existed only on paper, Task Force Butler had been drawn up shortly before the Dragoon landings by Truscott, who suspected that ongoing political fencing with De Lattre would cost him control of the Seventh Army’s only armored force, Combat Command Sudre, once the French went ashore. Unopposed Allied dive-bombers and fighters joined Butler’s armor in turning the upper Rhone Valley into an avenue of death and destruction. Charred German bodies and smoking vehicles littered the ground for miles along the river. But Butler’s force, even with reinforcement from elements of the 36th Division, was too late, too small, and too short on supplies to completely stem the northeastward flow of Blaskowitz’s Army. Now, a race for the Belfort Gap—the Germans’ escape valve into the Fatherland, north of the Swiss border—commenced, with tanks of the 11th Panzer Division fronting Blaskowitz’s skillful rearguard defense, and American and French units nipping at the heels of their fleeing foes. Truscott hoped to trap his quarry between his own lines and the right flank of Lieutenant General George Patton’s Third Army, which was advancing from the north. “Be vicious,” Truscott told his men, “Seek to kill and destroy.” But with supply shortages a constant concern, it was a frustrating, halting pursuit. On September 14, French troops on Truscott’s left made contact with Patton’s forces at Chaumont, but Blaskowitz managed to hold off Truscott long enough to slip thousands of his men into Germany. But by most measures, the lightning campaign for southern France was a startling success. Patch’s Seventh Army had cleared south and central France in half the time expected and taken some 100,000 prisoners at a tolerable cost of about 13,000 total casualties as of mid-September. And from a supply standpoint, Dragoon was a triumph. Despite German efforts to destroy as much as possible of the facilities of Marseilles and Toulon, both ports were open for business by September 20. By month’s end, more than 300,000 Allied troops, 69,000 vehicles, and nearly 18,000 badly needed tons of gasoline had poured into France via the Dragoon beaches. In a speech made shortly after the war, General Jacob Devers, who had assumed command of the Sixth Army Group in the wake of Dragoon, predicted that the operation would “probably go down as a classic for surprise, exploitation, and results.” At the very least, Dragoon sped up the delivery of food, clothes, gasoline, spare parts, and ammunition to hungry Allied armies waiting to plunge into Germany. The stage was set for the defeat of the Nazis. Eric Ethier has written many articles for America in WWII and other history magazines. 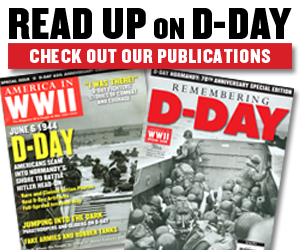 This article originally appeared in the August 2006 issue of America in WWII. 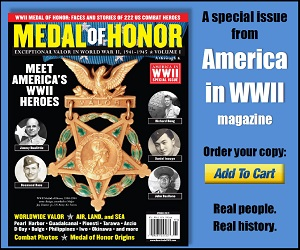 To get more articles like this one, subscribe to America in WWII magazine. Images, top to bottom: Vessels that landed 36th Division troops on Beach Blue lying off Naples, Italy; US infantrymen moving inland through woods in Southern France unopposed; members of the 15 Infantry moving inland accompanied by a tank with flotation gear; Vice Admiral H. Kent Hewitt (left) and Major General Alexander Patch (center), key commanders of the Riviera invasion, escorting Navy Secretary James Forrestal ashore on August 16; French townsfolk cheering US liberation troops moving through their town. Image credits: All from the National Archives.